This isn't one of our normal blog posts. It's more of a journal entry, than anything else. You see, I'm a bit sad today. The Raw Spirit Festival in Santa Barbara, CA, started today and I'm not there. We've been working really hard on many raw food projects, trying to sell our home, etc. So, spending the time and money to travel to the other side of the country for a weekend event just didn't seem like a good idea.I don't think we made the wrong decision, but I do admit I was hoping that somehow the Universe would conspire in some magical way to arrange for me to attend the festival this weekend. For those who have never been to a Raw Spirit Festival, you might wish that you could attend something so totally awesome---to be surrounded by raw foodies you've met online, to attend the various speeches and events at the festival, etc.---but you probably aren't feeling completely sad that you aren't there. To have attended a Raw Spirit Festival, had your entire life altered by the experience, and then to not attend the next one is almost heartbreakingly sad. Today, we thought we'd share another non-diet-oriented explanation of obesity. It's from Rhonda Byrne, author of the international multi-media phenomenon known as "The Secret," which provides readers with in-depth philosophical explanation and instruction with respect to the Law of Attraction. Wendi and I have The Secret on CD, and often enjoy listening to it. I think, in fairness, we both have a few legitimate criticisms about certain aspects of it (and I'll share one or two, below). However, on the whole, many of the ideas within resonate deeply for us and we find much of the underlying message profoundly uplifting and empowering -- especially (for me) much of the discussion regarding maintaining a healthy, positive, optimistic attitude and practicing gratitude. Hi everyone! Jim here with a really special treat for you today. I'm interviewing our friend Joe Prostko, who we've known for a good year or so through the Pittsburgh raw food meetup group. You may remember Joe from our cacao pod video a while back. Read more: Meet Joe Prostko, Who Has Eaten Almost 50 Pounds of Raw Cacao in the Last Year! I sense that there is a useful blog post on the topic of "raw during tough times." However, after pondering the topic at length, I'm just not exactly sure what to say about it. I do know that quite a lot of people come to feel disappointed in themselves for straying from the healthiest path. It's a story I've read over and over on raw web sites and blogs, perhaps more frequently in the winter. It starts out the same: Someone goes raw, gets all fired up about it, and soon starts feeling youthful and vibrant again. The high lasts for a while, but then ... something happens. They slip back to cooked foods -- or worse, to junk foods. Sometimes the process repeats itself for years. This weekend is all about having fun! We'll be working on the menu for the upcoming 3-Day Raw Food Spiritual Ashram Retreat that I've organized for the end of May. What does it mean to work on the menu? Well, it means I'll be making and sampling all kinds of gourmet raw food dishes this weekend! 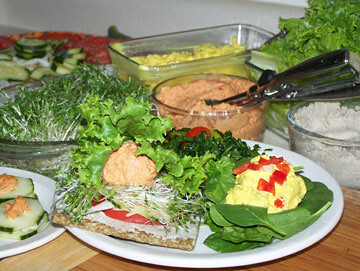 Read more: Fun-Filled Friday: Raw Food Retreat Meals! All this week we're going to be highlighting different sections of the All Raw Directory (A.R.D.). For those of you who don't already know about it, Jim and I created an amazing site (AllRawDirectory.com) to house links to every source of raw food information that exists on the Internet. It's a huge task, but we created the site so that it's community-run. Housing links to all of the information available within the raw food community is a near-impossible task for one individual, but as a group we can do amazing things! If you don't know how the All Raw Directory works, you are going to love the ease and simplicity of it all! Simply become a member (it's FREE and always will be!) and begin adding any raw food links that aren't already included (the system checks for duplicates, so don't worry about that). You can add your personal raw food blog, a raw food business, your social raw food media links (like Twitter, Facebook, GiveItToMeRaw, RawFu, etc.) for others to easily find you, share links to informative pages about the raw food diet/lifestyle, and so much more! Read more: Exploring the A.R.D. : Raw Food RECIPES! Okay, my Raw Fu 100 Day Challenge is set! I'm going to transition to the 80/10/10 version of raw. I'm doing it gradually, however. For the first 10 days, I'm eating no fats before dinner. Then with dinner, I'll eat as much fat as I desire, but I will be conscious of how much of it I'm consuming. For the second 10 days, I'm going to continue the same as the first week, but I'm going to reduce my fat in the evening to half of what I normally would eat. I haven't made set plans for the final sets of ten days, but I want to be following 80/10/10 by the beginning of the final week. Why 80/10/10? Because when I read about it, and I talk with others who follow it, it seems to make sense and work for others. After almost two years of raw foods, I am doing great with 90 pounds left behind, but I've been stuck at a weight that isn't really my ideal (I'm currently 137 pounds and I'm only 5'4"). I'm happy with myself, but my goal is to be as healthy and vibrant as I can be, to live a very long, fulfilling, energetic life. Read more: Raw Fu Challenge Is Set!!! Read more: Must We Exercise? I'm still working on the dishes that will be served at the upcoming 3-Day Raw Food Spiritual Ashram Retreat (only 2 spots left!). Today, I worked on the Sandwich Fixin's that will be served for lunch on one of the retreat days.